Got leftover quinoa and bored of the usual salads and pilafs? Here are a few ideas for what to do with leftover quinoa, with an emphasis on healthy, vegetarian and vegan leftover quinoa recipes. Each of these recipe ideas calls for pre-cooked quinoa, so if you've got some leftover, read on for delicious ways to use it all up. Got leftover quinoa? For a simple meal for one or two, stuff whatever leftover quinoa you've got into a bell pepper or a tomato, add a shake of garlic salt or whatever seasoning you like, perhaps some breadcrumbs or cheese if you're not eating vegan or gluten-free, and pop it in the oven at 350 degrees for about 20 minutes. Presto! You've got yourself a whole new meal. 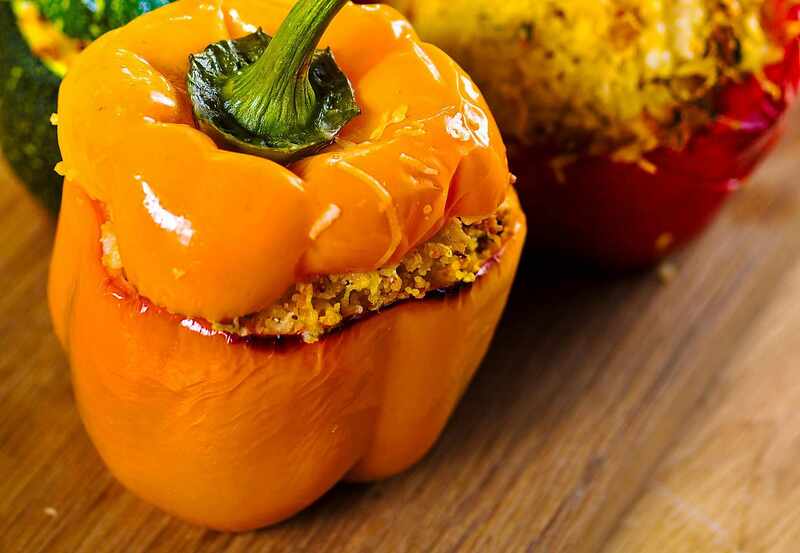 Like making stuffed tomatoes or bell peppers? Here are 8 ways to make stuffed tomatoes. Bored of quinoa salads? Use your leftover quinoa to create veggie burgers! You won't even know there's quinoa in there. Ok, so this recipe doesn't exactly hide the quinoa so if you're bored of quinoa, it won't do, but it's such a creative and unusual way to use up quinoa, that I had to include it. The savory stuffing flavors are very different than the usual quinoa salads, and, if you top it all off with gravy and add some mashed potatoes, you've got nearly a full meal. Keep some tortilla or wraps on hand (they freeze well and don't take up much space since they're flat), and pile on just about any kind of leftover quinoa you've got with a few veggies and a bit of salad dressing, mayonnaise or other sandwich fixings for an excellent wrap! Use your leftover quinoa with beans for a high protein burrito, add scrambled eggs or scrambled tofu for a breakfast burrito.